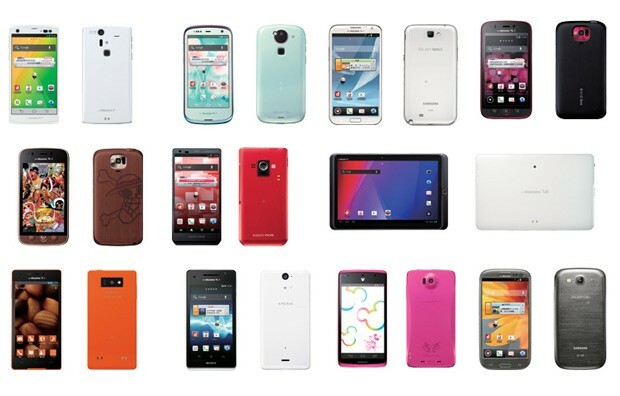 Just as the air begins to chill, NTT DoCoMo has announced its forthcoming line-up for release in November and December, including nine smartphones, four feature phones and a tablet. As the Japanese populace would no doubt demand, all of the bigger smartphones -- from the 4.7-inch Arrows V F-04E through to the 5.5-inch Galaxy Note II -- come with 1,280 x 720 displays, a healthy degree of water- and dust-proofing, plus decent quad-core credentials. The new Aquos Phone Zeta SH-02E stands out for its low-power 4.9-inch IGZO panel and 16-megapixel camera, while the Arrows Tab F-05E 10-inch tablet packs a 1,980 x 1200 display and what sounds like the latest 1.7GHz iteration of Tegra 3 (as seen in the HTC One X+). It's also interesting to a see a Korean-style variant of the Galaxy S III (the Alpha SC-03E) packing a souped-up 1.6GHz Exynos chip and 2GB RAM. In related news, NTT has also announced that it's parterning with Mastercard PayPass and will offer the contactless payment system for Japanese customers travelling abroad by fall next year -- and indeed all the new smartphones are NFC-equipped. Click the first source link below for the full run-down. NTT DoCoMo unveils winter lineup, pushes big displays, LTE, quad-cores and NFC payments originally appeared on Engadget on Thu, 11 Oct 2012 10:12:00 EDT. Please see our terms for use of feeds.